WASHINGTON November 22, 2013 (AP) – ABC News. 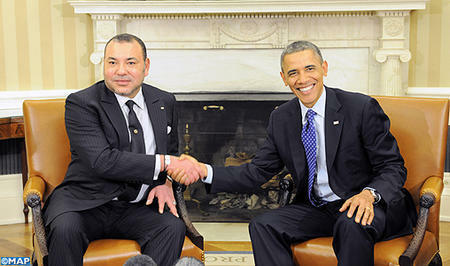 President Barack Obama hosted Morocco’s King Mohammed VI at the White House on Friday for talks on furthering democracy in the Middle East and countering violent extremism. Arriving at the White House, the king was greeted by a military honor guard that lined the driveway to the West Wing. In the Oval Office, Obama and King Mohammed made no public remarks before photographers were ushered out. Ahead of the meeting, the White House said Obama planned to discuss U.S. support for democratic and economic reforms in Morocco and efforts to promote reform in the Middle East and Africa. Cooperation on countering violent extremism was also on the agenda, the White House said. Fighting terrorism in North Africa is a major U.S. national security priority. This entry was posted in 4e-3e, Older students and adults, TEXTS and tagged information, USA. Bookmark the permalink.